The Harris’ Antelope Squirrel is often mistaken for a chipmunk because of its small size and white stripe on the each side of it's body. This squirrel was photographed at the Deer Valley Rock Art Center near Phoenix, AZ. The Harris’ Antelope Squirrel is diurnal and active year-round. When they become extremely hot, they lie on the ground spread eagle in order to reduce their body temperatures in cool shade or soils. 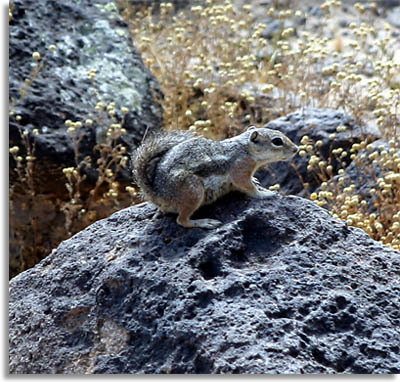 Harris’ Antelope Squirrel looks similar to the Cliff Chipmunks (Eutamias dorsalis) except the Harris’ do not have a white line on their faces, and the Cliff Chipmunks live at higher elevations. Below is a video about squirrels that can be found in Arizona, including the Harris' Antelope Squirrel.